While the interest in the average traditionally animated Disney film is getting lower with each new release - too much hype, too much formula and not enough Pixar wit and imagination for my money - the interest level in Japanese cinema seems to be on the increase. I think the average kid's vision of Japanese animation is likely to be the reprehensible Pokemon phenomenon, but in fact the real deal is sophisticated and beautifully made. Hayao Miyazaki is said to be the Japanese Walt Disney, although in fairness, Miyazaki has much more talent than old Walt ever did, who was ever the salesman, but Miyazaki is more of an animation auteur, in it for the art and the love of storytelling, not the product tie-in. 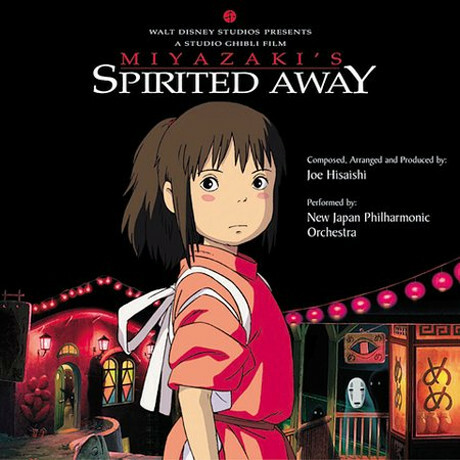 Miyazaki's regular composer is Joe Hisaishi who was brought to prominence in the west by the success of Princess Mononoke, but for Spirited Away is in lighter mood. The main theme is a surprisingly Hollywood piano melody that actually wouldn't be entirely out of place in a romantic comedy, although Hisaishi soon pulls into a more warmly epic orchestral arrangement. It is a simple tune, but the slightly unexpected syncopation and gentility are quite affecting. The favourite comment of Hollywood composers is how they approach animation as though it was live action, but there are always those cutesy moments they can't help but turn to Carl Stalling mimicry. Hisaishi, on the other hand, really does treat the material with a grown up sound world, so even cues that could have been turned into comedic creeping about, are treated seriously. This is not to say that Hisaishi avoids playfulness, on the contrary, Sootballs is a delightfully witty little march, as is the pizzicato led Procession of the Spirits, although a mixture of imposing brass and eerie vocals take the track off in an interesting new direction. These priceless little moments are pleasingly inventive when the music threatens to stall a little. Reprise (rather ironically) features an entirely new theme that is repeated throughout the track and curiously similar to Horner's An American Tail, but not distractingly so. The final track is a rather unlikely Japanese ballad, but is pleasant enough in its own way. Perhaps the biggest surprise is how un-Japanese the music actually is; there are hints on occasion, but this is firmly rooted in western composition and orchestration. Although a charming score with a few witty offbeat moments and plenty of drama where necessary, Spirited Away didn't quite strike me in quite the way many of the fervoured reviews might suggest. However, it compares very favourably with the best of Hollywood scoring for fantasy and animation, as such comes highly recommended.